Milawa is a rural village 15 km south-east of Wangaratta in north-east Victoria. It is situated on the Oxley Plains, between the King and Ovens Rivers. Soon after gold was discovered at Beechworth in 1852, a miners' route was formed across the Oxley Plains, south of Wangaratta. The Oxley township was reserved on the King River where it was crossed by a miners' route, and 4 km to the east the Emu Inn was opened in 1861 on the future site of Milawa. 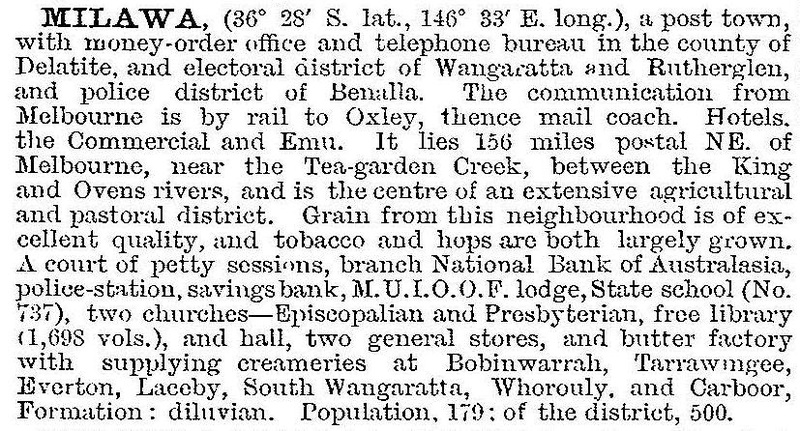 In 1864 a school was opened at Milawa, taking children from Oxley as well as its own area. At that time the area was known as The Square, and the shire secretary, George Brown suggested it be replaced with an Aboriginal name, derived from the word ‘millewa’ (Murray River). George Brown was a farming settler (1858) in the district, and moved to Milawa through marriage to the daughter of a Milawa farmer, John Graham. Brown extended his father-in-law's plantings of table grapes, and Brown's son made the first wine. This was the beginning of the Brown Brothers Milawa Vineyard. George Brown was the Oxley shire rate collector and a councillor at various times over 40 years, and one of his sons was a councillor and shire secretary. The Brown Brothers' imprint on Milawa has been strengthened by the Gourmet Trail tourist route eastwards through the Oxley Plains, taking in wine, dairy foods and homemade food outlets. Milawa village has a post office, primary school (66 pupils, 2014), two churches, a general store, a hotel/motel, food outlets and the Milawa Cheese Company. There are also a caravan park and a bowls club, and the recreation reserve and cemetery are outside the village. Brown Brothers' vineyards are particularly visible, but represent a fraction of the wine plantings they have throughout the district. About 8 km east of Milawa is Markwood. It was originally known as Tea Garden, and is situated on the Tea Garden Creek. It had a school (1872), and has a hall and a vineyard opened by a member of the Morris family, who are winemakers in Rutherglen. At the 2011 census, agricultural employment in wine/beverage manufacturing was 7% of all employment and other farming was 12%.